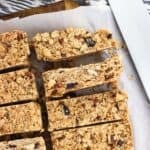 Spiced maple quinoa granola bars are a chewy and satisfying snack bar recipe that features toasted quinoa, pecans, oats, and more. These bars are held together by an almond butter and maple syrup mixture for extra heft and flavor! Ever have those recipes that stick around in your mind? 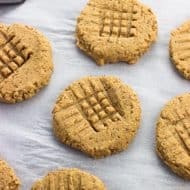 The ones that you might not make all the time, but have a craving pop up for on a semi-regular basis? 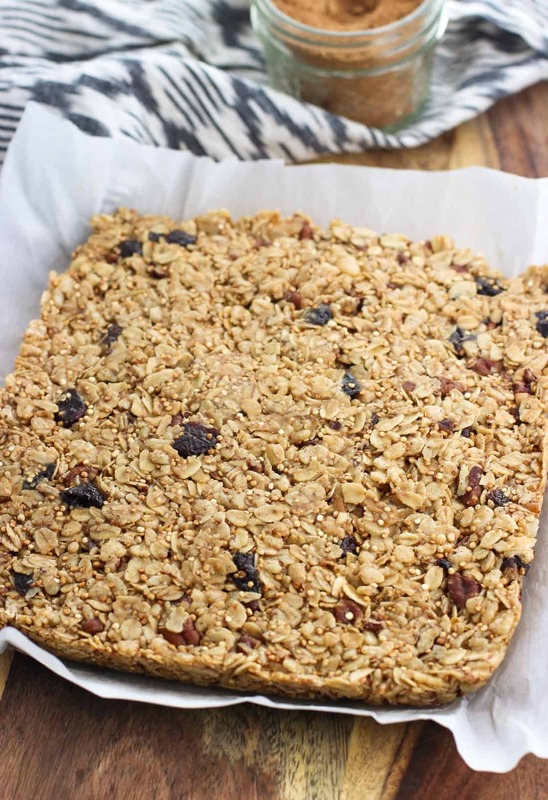 The base recipe for these spiced maple quinoa granola bars is one of those for me. They first made their blog appearance a few years ago in this coconut quinoa granola bars version, but I’ve been playing around with a few of the ingredients every couple of times I’ve made them since to land on this spiced maple iteration. Just in time for fall! Something that’s a requirement for a snack is staying power. Anything that isn’t very substantial or can be eaten mindlessly doesn’t really do the trick for keeping me full from lunch until dinner. For instance I’m a big fan of green juices, but sometimes they just don’t cut it as a snack because I’ll sip too quickly and my brain won’t register – hey lady – you just consumed enough calories to count as a snack. 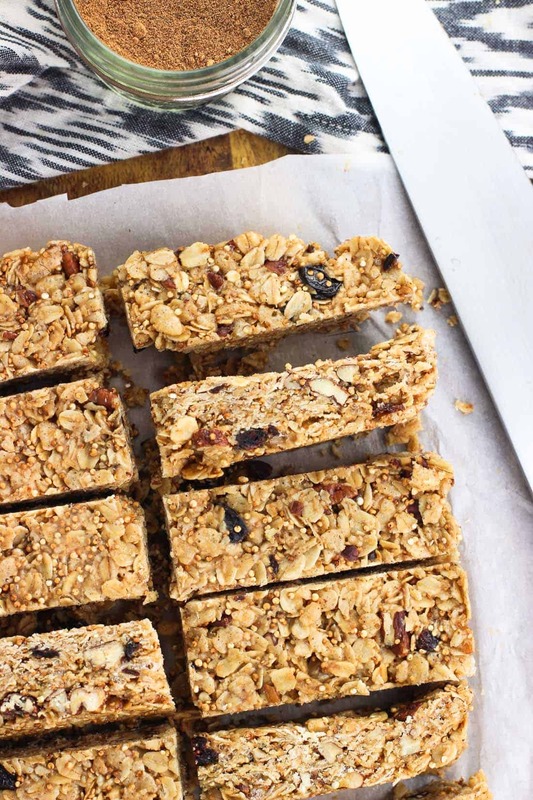 These maple quinoa granola bars are the opposite of that. 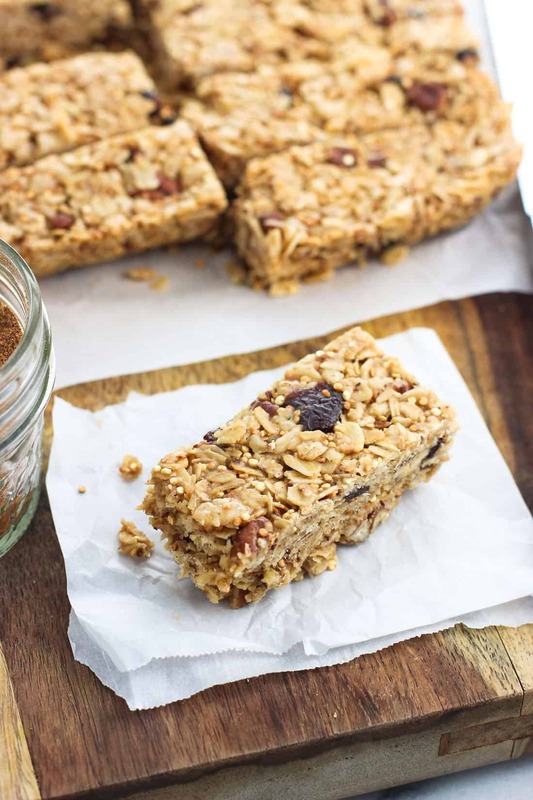 Oats, pecans, quinoa, and toasted rice cereal make up the bulk of these bars, and are combined with an almond butter/maple syrup mixture to form a chewy, hearty snack. 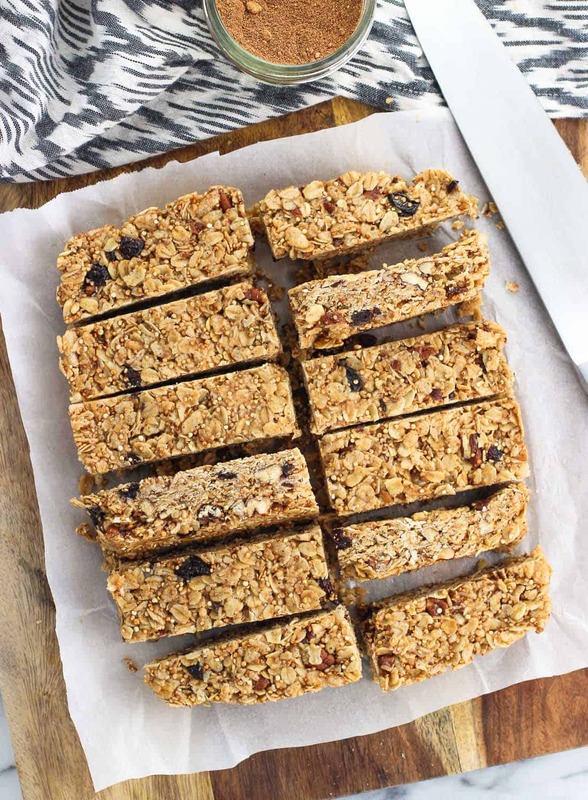 The toasted rice cereal provides a bit of crunch while dried cranberries and pumpkin pie spice play off of the maple syrup and round out the flavor profile of these bars. 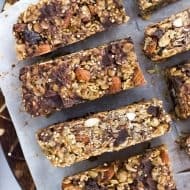 I hesitate to call these spiced maple quinoa granola bars ‘no-bake’ because the oven does have to be turned on, even if it’ll be toasting and not baking. 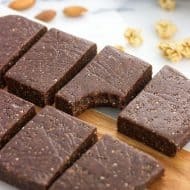 Toasting the oats, nuts, and quinoa gives them a boost of richness in flavor that add something extra to these bars in total, so I recommend not skipping that step! These bars hold up the best if they’re stored in the refrigerator. They won’t go bad if they’re not refrigerated, but they’ll be less firm and won’t hold their shape as well. I’ve pulled one out in the morning before work and kept it out of the refrigerator until the afternoon without much of an issue at all. I just wouldn’t leave one in my car on a hot day. Preheat oven to 350°F. 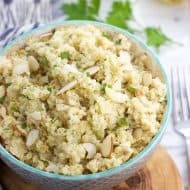 Add oats, pecans, and dry, uncooked quinoa to an ungreased, large rimmed baking sheet and toast for 12-15 minutes, stirring everything up now and again, until the oats are lightly golden and becoming fragrant. Remove and add oats/pecans/quinoa to a large mixing bowl. Add toasted rice cereal and dried cranberries to the mixing bowl as well and stir. Line an 8"x8" baking dish with parchment paper, ensuring that enough parchment paper sticks out along two opposite sides of the dish so that you can easily lift out the bars later on for slicing. Add almond butter, maple syrup, brown sugar, oil, pumpkin pie spice, and salt to a small saucepan set over medium heat. Stir/whisk to combine and cook for a few minutes, until mixture is smooth and just beginning to bubble. Pour almond butter/maple syrup mixture into the bowl with the oats, etc. Stir so that everything is evenly combined. Pour out mixture into the prepared 8"x8" dish and press firmly into an even layer. Pay close attention to the sides of the mixture to ensure the edges are packed in as densely as they can be. Refrigerate for at least 1 hour or longer so the bars firm up well. Remove from the refrigerator and slice into bars. Store bars in the refrigerator to help them hold their shape, removing a few minutes before eating so that they're not as cold.